THE WRITING BUDDHA - Opinions | Books | Movies: It must've Been Something He wrote by Nikita Deshpande (Book Review- 3*/5) !!! 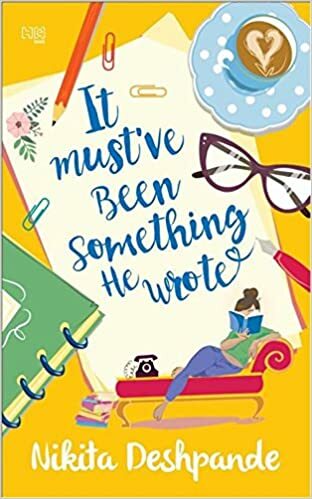 It must've Been Something He wrote by Nikita Deshpande (Book Review- 3*/5) !!! This weekend I ended up reading another book with a very big title written by a debutante Indian author- "It must've Been Something He Wrote" by Nikita Deshpande. The cover page of the book is very delighting which will surely catch the eye of the curious reader. The synopsis is yet again successful in gaining the attention and making the reader think of reading this story to know the adventure of Ruta between work and life in a new city. I have found that recently many authors are writing books on the book industry itself by drafting their characters close to a real-life personality- author, publisher etc. If you are closely associated with the Indian publishing industry from last 4-5 years, you tend to enjoy this book but if not, then its just a normal story for you about an author or publisher or a struggling author trying to get his first book published. The story of Ruta is amazing where she is not liked by her boss but keeps on trying things to impress him. But as destiny is written for each one of us in its own way, every time she is about to do something good, a disaster takes place. And the reason is always Ruta. Author have written such scenarios with great narration that you will feel pity with her but yet it excites you to know what happens in next scene. The book is great in the first half when the protagonist is playing charmingly with her personality with everyone. Her first meeting with Jishnu Guha is very interesting. The first thrashing in the meeting by boss is also laughable. Her blossoming relationship with Arjun is also worth-reading. But the problem lies in 2nd half when everything becomes spontaneous and consistent. You understand what the end would be like and that's when the book becomes predictable. Yes, there are some surprising moments but it is not enough to excite the reader in you. The climax is quite happening but as I said, predictable. Overall, it's a light read which can be in your list of favorites if you have just begun reading Indian fiction books otherwise it's something that can be easily missed. I give this book 3 stars out of 5.